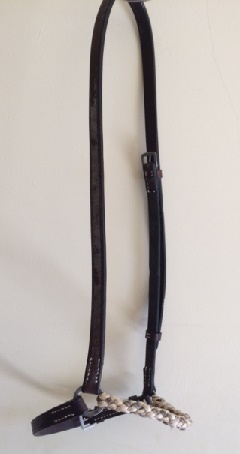 Cord and leather cheekpieces for gag bits. The leather comes in Havana brown or London tan. The cheekpieces come in two different types of fittings. Either the leather at the buckle end is fixed with a screw: or the cord is looped through the ring. In each case this enables you to put the cheekpieces through the rings of the gag bit yourselves. 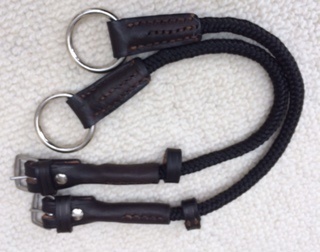 The screw type with Havana brown leather come with black cord and with London tan leather in white cord. 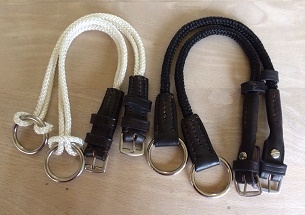 The looped type come only with Havana brown leather and white cord. They are sold in pairs.